Of the 4C's, clarity is the most misunderstood factor. This may lead people to unnecessarily overspend. But in fact, clarity is the least important factor. 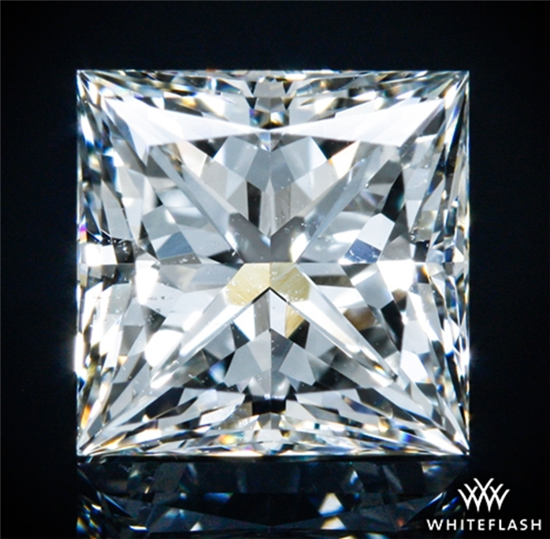 If you know what to look for, you can save a ton of money and still get a visually flawless diamond. Use that money instead on a bigger rock or nicer setting. Who wouldn't want that? Read on to learn all about diamond clarity. Don't pay for invisible features. In our opinion, clarity is the least visible factor. A flawless rock looks virtually the same as a lesser stone that is eye-clean. FL (Flawless). Only about 2% of diamonds fall into this category. IF (Internally Flawless). Tiny surface blemishes that are visible under 10x magnification. VVS1 VVS2 (Very Very Slightly Included). Very, very small inclusions that are hard to find under 10x magnification. They are visible to trained professionals after intense searching. VS1 VS2 (Very Slightly Included). Flaws usually not visible to naked eye. SI1 SI2 (Slightly Included). Flaws may be visible to naked eye. I1 (Included 1st Degree). Flaws visible even to the casual observer. As long as the stone is eye-clean, it will look perfectly flawless. Eye-clean means that you cannot see the flaws with the naked eye. Clarity is graded under 10x magnification. But in real life, no one is going to go around examining your diamond with jeweler's tools. In most cases, VS2 diamonds are all eye-clean. And you can even find eye-clean diamonds in the SI range (in fact, it's not even impossible at the I1 grade). So there's no need to pay extra for a flawless or almost flawless rock. You'll only be paying for features you can't even see. Tip: Unlike what some people think, higher clarity does not mean a more sparkly diamond. Diamond cut is the single biggest factor that determines the brilliance of the stone. A well cut diamond can be so sparkly that it hides flaws, meaning you can go lower in clarity. A well-cut SI1 stone will look a lot more beautiful than a poorly cut Flawless diamond. Clarity refers to the flaws on a diamond. There are two types: 1) inclusions, or internal flaws, and 2) blemishes, or flaws on the surface. To determine clarity, the Federal Trade Institute requires that a diamond be examined under 10x loupe. The clarity grade depends on what kind of flaws can be seen under the 10x loupe. The GIA grading scale for clarity is as follows (from best to worst). To help you visualize them better, we'll be taking screenshots from James Allen. FL (Flawless): Absolutely no flaws whatsoever under 10x magnification. This is super rare, only about 1% of all diamonds. IF (Internally Flawless): No visible internal flaws under magnification, but may have tiny surface blemishes, such as polishing lines. VVSI & VVS2 (Very Very Slightly Included): Almost perfect diamonds; very very small flaws that are difficult to see even under 10x magnification. In most cases, the most a trained professional can see is just tiny pinpoints. The difference between VVS1 and VVS2 is the location of flaws. VVS1 will have flaws in the bottom half, while VVS2's flaws may be in the top half as well. VS1 & VS2 (Very Slightly Included): Slightly larger internal flaws or multiple smaller ones; Usually slightly more visible under magnification, but not to the naked eye. VS1 diamonds are always eye-clean. VS2 diamonds are usually eye-clean as well. But some diamonds may contain noticeable flaws, especially if the diamond is larger. The difference between VS2 and VS1 is in the size, location, and types of flaws. VS2 may have bigger flaws located more towards the top or center. It may also begin to have black carbon crystals (which are usually not seen in VS1). SI1 & S12 (Slightly Included): Inclusions are pretty easily seen under magnification, and possibly visible to the naked eye. 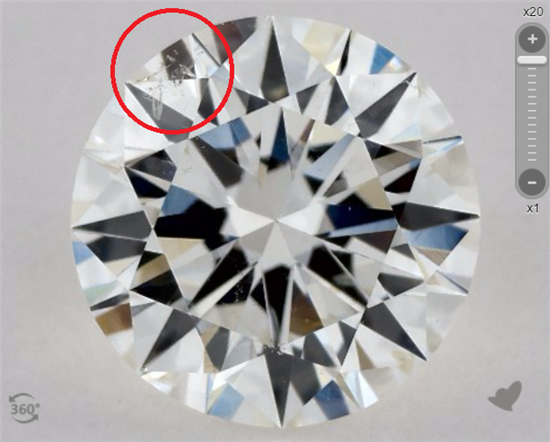 SI2 diamonds have flaws that are more likely to be seen by the casual admirer. As you can see, flaws don't start to become very noticeable until the SI range. And keep in mind that you're looking at enlarged photographs. When looking at an actual diamond, it'll be a lot smaller. Now let's first go over the common types of flaws you're likely to see. Crystals: These are minerals spots in the diamond. The two most common ones are white crystals (the best because they blend in) or black carbon spots (which if larger, would look like a speck of dust you can't rub off). Pinpoints: Very, very tiny crystals that just look like a dot at 10x. These cannot be seen and are no problem at all. Clouds: This is a cluster of pinpoints that may look like one larger flaw. If it's too big or dense, this may be visible or make a diamond appear a bit hazy. Needle: A long and thin crystal (like a rod) and is usually white in color. Feathers: Internal cracks. Watch out for where the feather is located. If it's near the edge, this may make the diamond susceptible to chipping. Graining: Caused by natural abnormal growth of the diamond's crystal structure. Graining could look like lines or a reflective white area, and can make a diamond appear hazy. It can either be internal or on the surface. Twining wisp: Flaws caused by irregular growth of the diamond's crystal structure. This is usually a group of clouds, pinpoints, feathers, and crystals. Cavity: A small hole/void in the diamond. Usually, this happens when a crystal at the surface falls out during polishing. Chip: A surface blemish usually either caused during the cutting process or during wear and tear. Diamonds are the hardest thing on Earth, but it can still chip given a sharp blow in the right direction. Scratch: An abrasion on the surface. Bearding: Very small fractures/feathers on the girdle (the edge of the diamond between the top and bottom halves). This happens when there was too much pressured applied when making the girdle and the edge becomes rough. About 99% of the world's diamonds contain some sort of flaw. Of course, some flaws are better than others, such as small pinpoints or a white crystal. The type of flaws determines the diamond's clarity grade. Clarity has a huge impact on price, because the more flawless the stone, the more rare it is. In this example below, we used the benchmark of 1-carat, color H, and Excellent cut. You can see how the price changes as we go up and down in clarity. But as long as you get an eye-clean stone, a VS2 or SI1 diamond will look just like a Flawless diamond. So don't spend the extra thousands on a feature that makes no visible difference. Put it instead towards an excellent cut and a bigger rock (which is visible). That said, not all flaws are created equal. The clarity grade is usually assigned based on the size of the inclusion, and not the color or position. Some flaws are white or transparent, and some are black. Some are hidden towards the edge, and some are in the center where it's more noticeable. The flaw can even be placed in a spot where it gets reflected by the pavilion facets many times over. The clarity grade doesn't tell you how the flaw looks on the diamond. 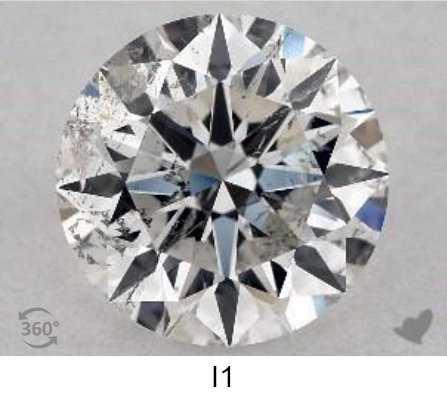 For example, both of these 2 diamonds found on James Allen were rated SI2 by GIA. They're the same size and cost the same. And yet, they look completely different! If you are now convinced that you don't need a high clarity stone, you're going to need to know what kind of "desirable" flaws to look for. Look for inclusions along the edge. The worst locations for flaws are right under the table facet. Inclusions more towards the edges are less noticeable and can be hidden with prongs. Inclusions in the pavilion (the bottom part) can be hidden in a bezel setting. The above is an SI2 diamond with multiple inclusions consisting of clouds, twining wisps, and feathers. But the most noticeable are the flaws at the edge. Luckily, this is easily hidden with a prong. However, be careful if it's a feather (internal crack) near the edge. Hitting it in the right direction could cause a chip. Look for well spread-out inclusions that are less visible. White colored inclusions (such as a white crystals or white feather) are the most desirable because they blend in. Clouds that are well scattered also look less visible. The worst ones are dark crystals right under the table facet, which will look like dust specks that you just can't rub off. The above SI1 princess cut diamond has a number of clouds and small crystals spread out across the diamond. You will not be able to see them with the naked eye. Unfortunately, if you're buying a diamond less than VS2, you cannot be sure that the diamond will be eye-clean. Without a photo, there is no way to tell based on the grading report alone what kind of flaws the diamond contains. As you can see, the same clarity grade can look wildly different. So customers may feel like they have no choice but to purchase a diamond higher in clarity. It's best that you're able to examine the stone in person, or at least view high-def magnified photos. Tip: If you're buying online, we like James Allen, who has 360-degrees HD videos for each diamond. So you can pick out the ones that appear eye-clean. We also love Whiteflash, which labels a diamond as eye-clean only if their professionals have examined it to be so. A clarity plot is a diagram that shows the location and type of every flaw or blemish in the diamond. No two diamonds are alike, so this plot acts like "fingerprints" for your diamond. Usually, the GIA report will include a clarity plot for diamonds 1 carat or over. You can use it to get an idea of what kind of flaws the diamond has. But it doesn't show the whole picture. The plot won't tell you if the crystal is a transparent white one or a black one. Or if the cloud shows up as haziness. 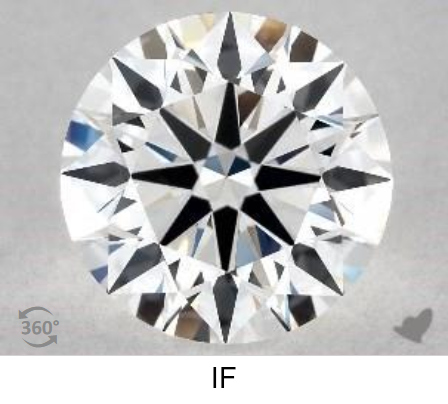 For example, for the round diamond below, the clarity plot is quite messy, but it yields an eye-clean diamond. However, not all clarity plots can be completely trusted. For example, below is the clarity plot for an SI2 diamond. Looking at how clean it is, it should be no less than VS2! If you read the fine print carefully, it says "All clarity characteristics may not be shown." Clearly, GIA graded this diamond as a SI2 for a reason, yet the clarity plot does not reflect that. If you're buying a diamond online, the clarity plot can be referenced but keep in mind that it won't tell you the whole story. 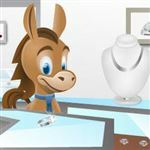 If you're buying a diamond in person at a jeweler, it's a good idea to have the jeweler go over the flaws with you and draw them in a clarity plot. Remember that the diamond's flaws are its fingerprints. This way, when you go back later to pick up the ring, you can have the jeweler go over the diamond with you again and match up the flaws. This way, you know it is the same diamond you purchased. Cut is the most important. A perfectly cut diamond will exhibit a lot of brilliance to the point that it masks inclusions. Never skimp on cut! With a high-quality cut, you can get away with a diamond lower in color and clarity. 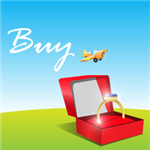 VS2 diamonds are the sweet spot for getting a good quality diamond and saving money. It's usually a safe bet that the diamond will be eye-clean. If you're on a more limited budget, SI1-SI2 diamonds offer even better value. But you'll have to examine the diamond to make sure you can't see flaws. Go higher in clarity with step cut diamonds. Round diamonds are the priciest, but they also do a fantastic job of hiding imperfections (with an ideal cut). However, step cuts (such as emerald and asscher) have a large table straight into the depth of the diamond. Thus, flaws are more easily seen. We recommend no less than VS2, or VS1 for diamonds larger than a carat. Size matters too. Want a bigger rock? You'll probably have to pony up for a higher clarity too. Larger rocks (2 carat and over) will show more flaws as the facet sizes are larger. So we recommend that you go for a clarity grade VS1 or above in those cases. Stay away from Included Diamonds (I1 - I3), as they have large inclusions that affect the diamond's brilliance. And plus, durability becomes at stake too, as diamonds with large flaws are more easily chipped. Make sure the diamond is certified by GIA or AGS. These are the two most reputable labs with the highest grading standards. So you can trust that the diamond has been graded properly. 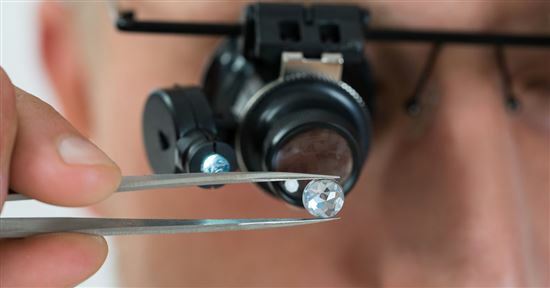 Another lab may grade the diamond as VS1 and even be priced less expensively. But in reality, the diamond could be graded as VS2 or SI1 by GIA. So you don't want to pay for something that only looks good on paper. It is really not necessary to spend extra money to buy a diamond high in clarity. As long as the diamond is eye-clean, the diamond will look flawless. Of course, if you have the budget and are after perfection, then go for that Flawless of VVS stone. 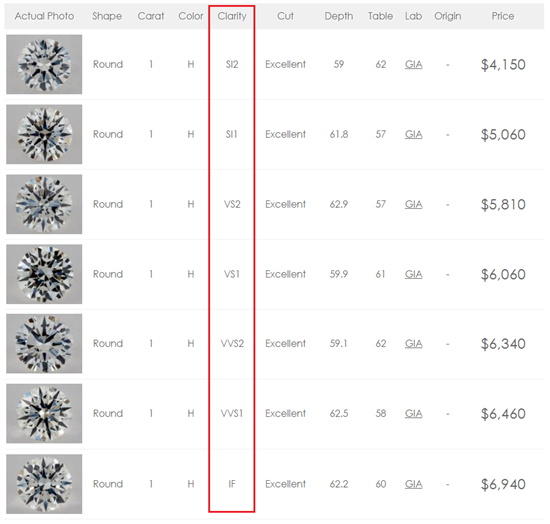 But if your main concern is best value, then you can find diamonds that look just as visually flawless in the VS2 and SI ranges. Save the money and put it towards a better cut, better color, or large rock. 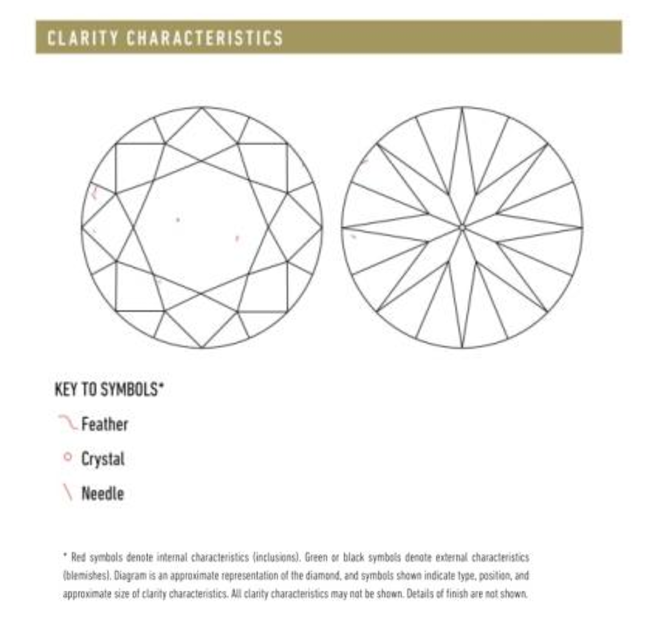 Share on Facebook "Diamond Clarity: What You Need to Know"